The TVC is a high performance magnetic volume control. It is a raw transformer requiring to be used with a suitable 20 position switch or with suitable relays in the context of a suitable piece of equipment. It is not a finished product ready for use in an audio system. The primary application is in so-called passive preamplifiers, more precisely passive control units. As such it allows a number of functionalities, the most relevant being the ability to change the output level of the passive control in multiple steps to control the volume of a high fidelity system. Applied in a passive control unit the Silk SQ Supermalloy by applying transformer technology offers a material improvement over all previous such schemes based around resistive attenuation. The so-called passive preamplifiers appeared on the map of High Performance Audio with the emergence of the CD Player. Modern Sources, such as CD-Players, DVD Players, SACD Players and others generally offer output levels sufficient to drive power amplifiers to full power (usually 2V RMS or more for digital full scale) and also offer sufficient drive for external devices and cables. Most CD-Players and similar devices have output impedances lower than 1kOhm, most are materially lower. Whilst “passive preamplifiers” initially created notable interest as a sonically extremely pure method of controlling volume and selecting inputs, they have soon faded back into obscurity, not surprisingly as most of these devices suffered from substantial impedance mismatches with either sources or loads. If for example a 5k Ohm resistive volume control where to be employed in a passive control unit the source would be required to drive all the time a quite severe load of 5k Ohm. If combined with a 1k Ohm source impedance the worst case output impedance of the combination would be 1500 Ohm at -6db attenuation, while at -20db attenuation the output impedance would still be around 540 Ohm. If combined with around 1nF load capacitance (easily found in longer, high capacitance interconnects). This leads to a 0.3db attenuation at 20KHz for a 20db attenuation setting, practically showing the absolute permissible limit for load capacitance. The worst-case attenuation at 20KHz almost reaches 1db!!! If, to provide our source with an easier load we where to choose to use a 50 kOhm resistive volume control we must either accept drastically higher levels of roll off at 20kHz or we must limit the load capacitance to less than 100pF. Such a level of capacitance (100pF) can be easily found with only 1m of high quality interconnect cable and is often exceeded by the input capacitance of many Amplifiers! Thus the resistive volume control employed in passive control units must navigate a course between the Scylla of excessively loading the source, leading to increased distortion and the Charybdis of excessively high output impedance. The introduction of the magnetic volume control Silk SQ Supermalloy neatly cuts through this tangled Gordian knot of contradicting requirements, making possible passive control units that actually work more effectively and in a much wider range of environments. Over time several minor revisions where made to earlier versions of the Silk SQ Supermalloy, covered in this document is the most current revision with regards to specifications and measurements. The transformer is housed in a Mu-metal shielding can that measures 60.25mm (23/8in) in diameter x 72mm (213/16in) in height, excluding the connecting leads. No inbuilt mounting hardware or mounting provisions are included, due the substantial size and weight of the transformer which would make the conventional method unreliable. The best mounting solution is to apply the same type of mounting clamp used for large size electrolytic capacitors (available from any good electronics supplier). The input and output connections are made via silver coated 0.6mm dia. (22gauge) copper wire. With these values the steps by which the volume is changed over the majority of the range is smaller than the commonly acknowledged limit of audibility (3db), giving a sufficiently fine control over the volume, when compared to continuous controls. Obviously, any attenuation is reliably repeatable. The full primary has around 200 Ohm DC Winding resistance. The same applies for the secondary winding. The primary inductive reactance at 20 Hz is in excess of 50 kOhm (400 H Primary Inductance) and thus provides an input impedance of more than 50 kOhm across the audio band if the secondary loading is infinite. The primary winding has a tap that allows the transformer to give 6dB of gain when the output is set on the 0dB tap. This is especially useful with power amplifiers having a minimal number of stages and thus lowers gain than common. An example may be a 2-Stage Single Ended Valve Amplifier using Western Electric 437A or Reflektor 6S45PE Valves in the input stage and 45/2A3 or 300B DHT as output valves. Such an Amplifier often has a gain of only 16 – 18db and requires around 1.5V RMS for full power. Depending upon the source and recording the added 6db Voltage gain may make the difference between subjectively satisfying volume levels in such a system or requiring more gain. The input impedance of the Silk SQ Supermalloy is strongly dependent upon the load impedance and selected attenuation. The worst-case input impedance occurs with no attenuation selected, in this case the input impedance will equal the load impedance plus the copper losses for the unity gain connection/version. As the Silk SQ Supermalloy should not be used with loads lower than 10kOhm the use of a 2.2uF or larger coupling capacitor in equipment preceding the Silk SQ Supermalloy should suffice in all conditions unless the device is operated with the split primaries in parallel. In the case of operation with 6dB of gain and with 10kOhm load on the output the worst-case load impedance on the source will be 2500 Ohm plus copper losses. This is a very severe loading and many items of consumer electronic will not be able to drive such a load adequately! It is thus recommended that the 6db step-up load be used only with relatively high impedance loads (> 40kOhm) for the Silk SQ Supermalloy, like for example Valve Amplifiers. If the 6db step-up connection is to be used with a 10k load on the output the preceding coupling capacitor should be no smaller than 10uF. As soon as the signal is attenuated (which is the way the Silk SQ Supermalloy will be operated in most cases most of the time) the input impedance rises and is ultimately only limited by the Inductive and Capacitive reactance of the primary winding near the outer edges of the audio band. In the midrange the input impedance of the Silk SQ Supermalloy based device can become VERY HIGH, with a 10k load and 14db attenuation selected the midrange input impedance will approach 250kOhm. Hence, in the subjectively critical midrange, the loading of the source is drastically lowered, resulting in most cases in drastically lowered distortion from the source. The limit of the input voltage to the Silk SQ Supermalloy depends upon the exact frequency and also the source impedance. For a source impedance of 600 Ohm and the unit gain connection a maximum level of +20dbu (7.75V RMS) is permissible above 40Hz before distortion becomes problematic, at 20Hz +14dbu (3.875V RMS) are permissible. If the split primaries are connected in parallel the level at 20Hz is limited to +8dbu (2V RMS) and above 40Hz to +14dbu (4V RMS). It should be noted that if the specified level is exceeded no damage as such will occur; the device will simply start to show increased distortion. This distortion will only happen at very low frequencies and consist of very low order harmonics, which are usually considered subjectively harmless. So while potentially reaching several percent THD at low frequencies for a severe input overload. In most cases even such levels of distortion will be inaudible or at the very worst musically quite benign. The input to the Silk SQ Supermalloy must be COMPLETELY free of DC offset; the presence of DC current materially degrades the performance of the Silk SQ Supermalloy Transformer, both with respect to level handling and frequency response. The Source impedance in general should be as low as possible, the lower the impedance from which the Silk SQ Supermalloy is operated the lower the distortion and the wider the effective bandwidth. Generally subjective performance is also improved with lowered drive impedance. It is however not useful to go to extremes, for the unity gain version the 200 Ohm primary winding copper loss suggests a sensible limit to lowering drive impedance at around 60 Ohm, anything lower will not improve thing all that much. At the highest source impedance point the bandwidth may be somewhat compromised and distortion will rise. For the unity gain connection the sensible upper limit of impedance is around 5kOhm, this causing a -1db point of 20Hz. If more attenuation at very low frequencies is allowable (or indeed desired) however, a source impedance of around 15kOhm will result in a -2.7db roll off at 20Hz. For the 6db step-up connection the maximum suggested drive impedance is no higher than 1.25kOhm, again causing a roll off of around 1 db at 20Hz. If a 3db roll off at 20Hz is permissible up to 5k source impedance is permissible. However, in the interest of overall performance it is strongly recommended to keep the drive impedance to the Silk SQ Supermalloy as low as is practical. The output impedance of the Silk SQ Supermalloy follows a fairly complex patters but the worst case is basically present with no attenuation. In this case the source impedance and the copper losses solely determine your output impedance for the unity gain connection. Thus for a CD-Player with 200 Ohm output impedance the worst case output impedance after the Silk SQ Supermalloy is around 600 Ohm. If the Silk SQ Supermalloy is used with 6db step-up the source impedance is “stepped up” too, namely by the square of the step-up ratio (2), so our 200 Ohm source impedance becomes 800 Ohm which are added to the 400 Ohm copper losses, for a total worst case output impedance of 1200 Ohm. For reference, the output impedance of the popular Audible Illusions Tube Preamp’s linestage is 1200 Ohm. The highly reviewed Conrad Johnson Premier 17LS linestage has around 850 Ohm output impedance. With all transformers the ultimately realized output bandwidth is very much system and application dependent, but the bandwidth limited Silk SQ Supermalloy when driven from a sufficiently low impedance (1kOhm or less) will provide a usable bandwidth of at least 10Hz – 100kHz (+/-1db) or better (see graph). In some cases the presence of a large section of unloaded secondary may cause an ultrasonic peak to appear in the response. How much of a problem this represents depends upon many factors. 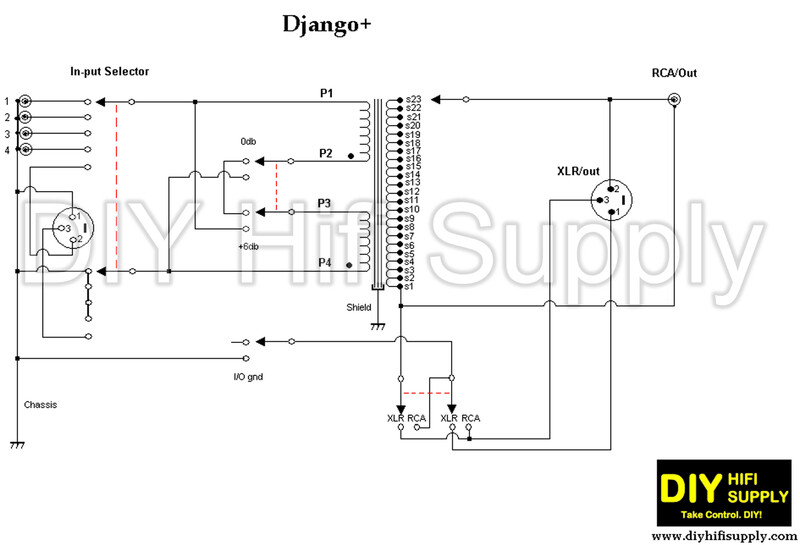 If this is encountered as a problem the simple solution is to provide a series RC Circuit (snubber), which is connected between the 0db attenuation Tap and the output of the switch. Suitable Values should be determined by lab-testing and listening tests.